Yes, as a matter of fact that is ME taking in a view of the beautiful blue-green Atlantic from behind MY mansion in Newport (and over there is my bridge and it’s for sale if you want to buy it). Normally, I’m not overly fond of the popular tourist hangouts. I usually think they’re too crowded, over-hyped, and ridiculously expensive. But I love Newport, Rhode Island. And yes, it’s crowded, in summer. But in Newport, I actually like the crowd. It’s a beautiful crowd, vibrant and happy! Summertime Newport is like the hoity-toityest carnival in the world. In Newport you can believe in the possibility that ordinary people like you and I might–wait, in fact we ARE–walking where the Astors and Vanderbilts and Jackie Kennedy trod. And nobody asks us to leave just because we’re not famous or rich. Nobody (well almost nobody) scans us with a disdainful head-to-toe inspection that assesses whether we belong. Because Newport LOVES its tourists. Because every summer, tourists come in droves to willingly part, hastily, with much Moohlah. In the next weeks, I’ll be featuring my insider tips (I live in Rhode Island and hang out frequently in Newport) for leisurely things to do, good food to eat and where to stay, both for when you want to treat yourself to an ooh-la-la experience and when your budget demands a low-cost excursion. Let me convince you that you ought to visit us here in the biggest little state in the Union! When were you last in Newport, and when are you coming back? 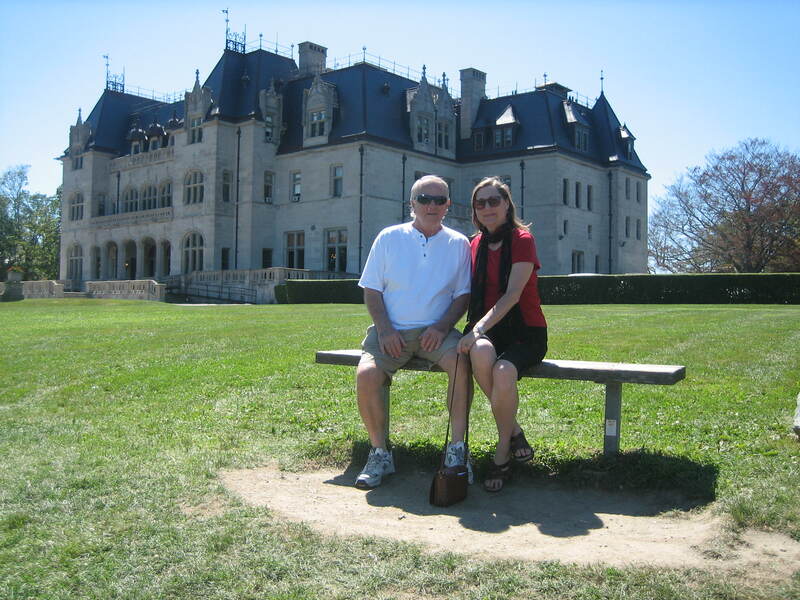 As for someone who lives in CT, Newport is our favorite retreat, and we typically visit at least one a year. Insider tips sound wonderful, looking forward! I like everything about Newport – food, mansions, cliff walk, people on the street… White Horse Tavern and Black Pearl are two of my favorite places to eat. I can go to Marble House probably every day (yes, may be I’m exaggerating, but not by much). I’m with you on White Horse Tavern and Black Pearl–although they’re no longer “trendy” enough for some people. I like the Black Pearl Tavern better than the Commodore’s Room. Last time I was there (in the Tavern), Martha Stewart was dining in the corner near the fireplace and no one bothered her or stared at her, because, hey, in Newport, celebrities showing up is normal. And give a heads-up whenever you’re planning on being in the area–maybe we could all get together to chat over a bottle of wine! Sounds good – I would love to do that! Please do visit–and when you do, let us know so we can meet you! (Europeans tend to miss Rhode Island because it’s so very small–but it’s definitely worth the stop-over and it’s conveniently located at the apex between New York City, Cape Cod, and Boston). It’s been a few years, but I agree, Newport is beautiful. I love those mansions. (yours is lovely, btw.) And the old town ghost walk is super spooky. You can stay at my mansion anytime you’re in town. (just check in with the folks at Salve Regina–they’re using it for education purposes, but if you tell them I sent you, you’re in–like Flynn). I’ve heard that scary-thing about the ghost walk which is why I’ve never done it. Spooky stuff gives me nightmares. Newport is one of my favorite places. My husband and I plan to visit in September. My parents lived in Rhode Island for many years and we loved roaming the streets of Newport together. By the way, have you ever been to Aunt Carrie’s restaurant in Point Judith? We can’t wait to get there to enjoy their delightful whole clams, clam fritters, chowdah, and blueberry pie! Seriously–you’re going to be here in September?? Let me know when, hopefully it will work out so we can connect!! One of the four states that I have never visited—this gives more plenty of reasons to reduce the number to three in the near future! I love this post, Tracy. In 1975, college friends and I spent a week in Newport and loved every hour. Your post and details remind me that I want to go back! But I know how it goes, I keep saying I’ve got to get my act together and get to NYC; but, daily obligations have a way of messing up my act. Sounds wonderful, Tracy. My web designer is in the area, and long ago I was impressed with RI’s beauty when I visited an elderly friend in his mansion on Narragansett Bay. A great memory! Had a nice visit there with Suzanne when she was in middle school. We stayed in a B&B that may have been called Queen Anne. She wanted to go have fun somewhere because her brother was going somewhere and she was not invited. Maybe he was on a college visit. I’ve forgotten now.